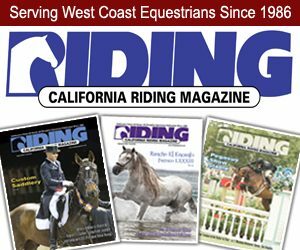 A common error in basic training is riding a young, green horse too much in circles. Some western trainers in particular believe that “circling never hurt a horse.” But it can, if it is not interspersed with a lot of work on long, straight lines. Too much circling can habituate a horse in moving crookedly. In the gradual development of a good mouth that accepts the bit evenly on both sides, a lot of riding straight forward is necessary. Normally, a horse has had enough circling on the longe line and in long reins. 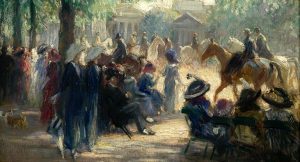 Accordingly, when beginning to cultivate a good mouth, I recommend schooling in the open, or in a large rectangular arena rather than in a ring. And I believe you will get better and quicker results if you use a drop noseband, correctly adjusted. There are different styles of nosebands, and it does not make much difference which kind you prefer, but correct adjustment depends a good deal on the horse. A horse with a quiet, steady mouth will go well with a noseband a hole looser, about an inch looser, than another animal of a more nervous temperament. But the noseband should never be so snug it distracts the horse or causes discomfort. A good general rule is: depending on the meatiness of your hand, you should easily be able to slip two or three fingers inside the noseband. you might also check the degree of snugness by offering the horse a small tidbit; he should be able to take it and chew it. Most horses, like people, tend to be more or less one-sided; that is, they are stiffer on one side than the other, usually the right side. The reasons why they are so, have kindled endless speculation and theorizing, all of it as fruitless as the philosophers’ conundrum as to how many angels can stand on the point of a needle. “Ride your horse forward and ride him straight” is an axiom of intelligent training. The going forward is relatively easy. The difficult part is straightening a crooked horse, and keeping him straight. 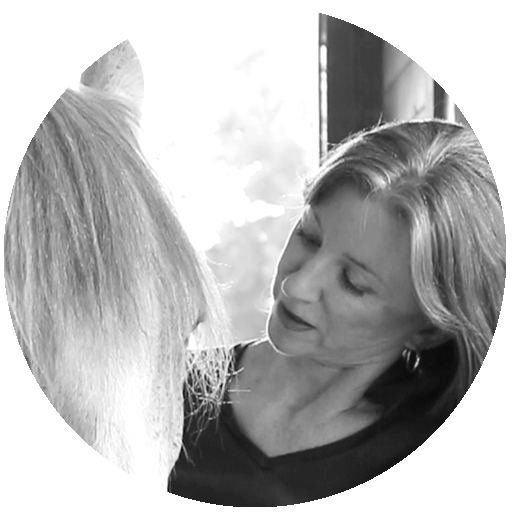 The surest way to do this is to take up an even contact with the horse’s mouth and apply unilateral half-halts with the rein opposite the hollow side of the neck. You need be in no doubt about which is the hollow side; the horse will carry his head slightly, or in extreme cases more than slightly, to that side instead of moving with his neck straight. Also, in turning he will bend and turn more readily to the hollow side than to the opposite side. A notice trainer mounted on a horse that moves this way will be naturally inclined to let the rein on the hollow side fall slack and to tug on the opposite rein in an attempt to pull the horse straight. This, however, is about the worst thing you can do. The only result is to make the stiff side of the neck stiffer (the tug-of-war principle) and that side of the mouth tougher. Instead, the rider should maintain a steady, firm contact on the hollow side, drive the horse forward with good impulsion, and break down the stiffness with repeated half-halts on that side. It is worth repeating with emphasis that a half -halt is not a jerk. When we jerk on a horse’s mouth, which we never should, we let the rein or reins fall slack, then sharply take up the slack by drawing our hands more or less forcibly to the rear. 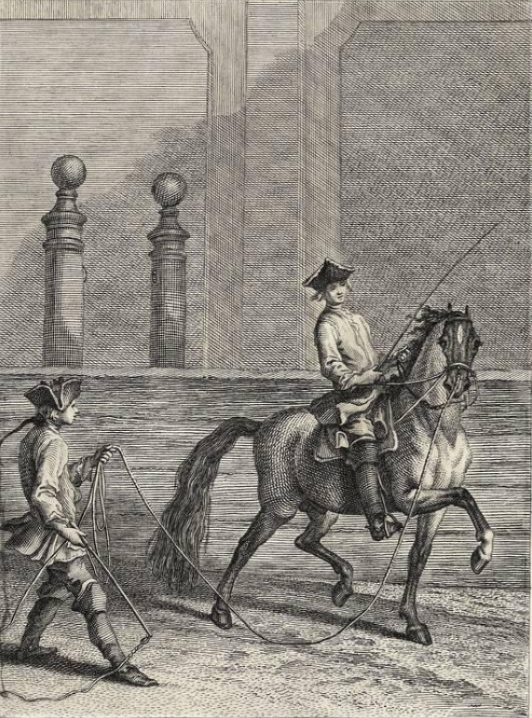 A correctly executed half-halt, on the contrary, merely increases and decreases tension on the rein without ever losing contact with the horse’s mouth; the rein never falls completely slack. The rider simply flexes one’s wrist as well as the fingers; but contact with the mouth is never lost, the rein remaining always taut. Eventually the worst offenders will respond. It is only a matter of time; this differs with every horse. But the rider must be constantly alert that the horse stays straight, accepting an even contact on both sides of the bit. It is very easy to backslide before a young or a spoiled horse is thoroughly confirmed in accepting the bit evenly. I have found it helpful, in working on this phase of the mouth, to turn the horse to the stiff side when it is necessary to turn around. This may be a minor point, but it helps. A jerk is painful and abusive; it upsets the horse and provokes resistance. The half-halt induces the horse to yield. One cannot set a time-table in this work of straightening a horse. 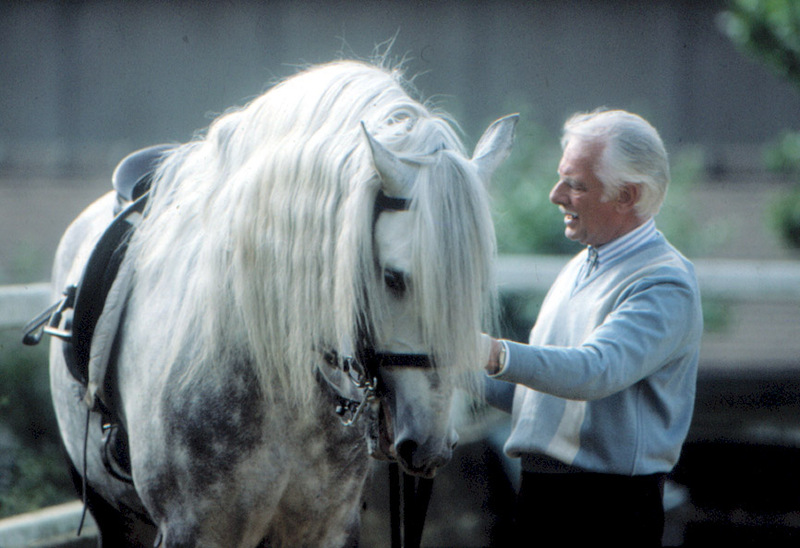 It depends on the individual animal and on the rider’s skill. But the habit of straightness must be confirmed, not only on long lines, but on large circles as well. The horse must accept the bit evenly on both sides. A collected horse must be on the bit, but a horse on the bit need not be collected. A horse schooled to go on the bit seeks contact with the rider’s hand. That is, if the rider gives an inch or two of more rein, the horse stretches his neck, reaching to re-establish contact with the bit. If the rider takes, the horse responds by relaxing his lower jaw and almost imperceptibly opening his mouth and “chewing” on the bit. The head remains naturally low with the neck stretched. The horse remains uncollected. This work is best started at a slow, natural trot. As the horse improves, change the gait to a working trot. These repeated flexions of the lower jaw should always precede attempted flexion at the poll leading to collection. Once you succeed in softening the lower jaw flexion the poll will naturally follow. Lightness is the result of mobility of the lower jaw. A beautiful headset is not the cause of lightness; it is the result, the effect. As long as the jaw remains stiff the whole horse will be stiff. To lighten and balance your horse while cultivating his mouth, keep him guessing and hence alert. 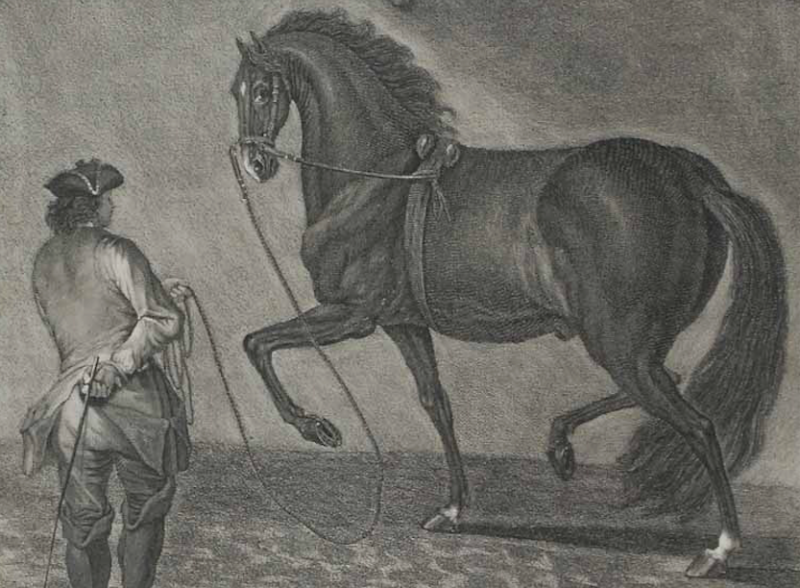 Demand frequent transitions from walk to trot and back again with changes of speed. When you halt, yield the reins; let the horse relax. Post at the trot to make it easier for him. School at least twice as much in the open as in the ring. Always keep in mind that what you do is less important than how you do it.